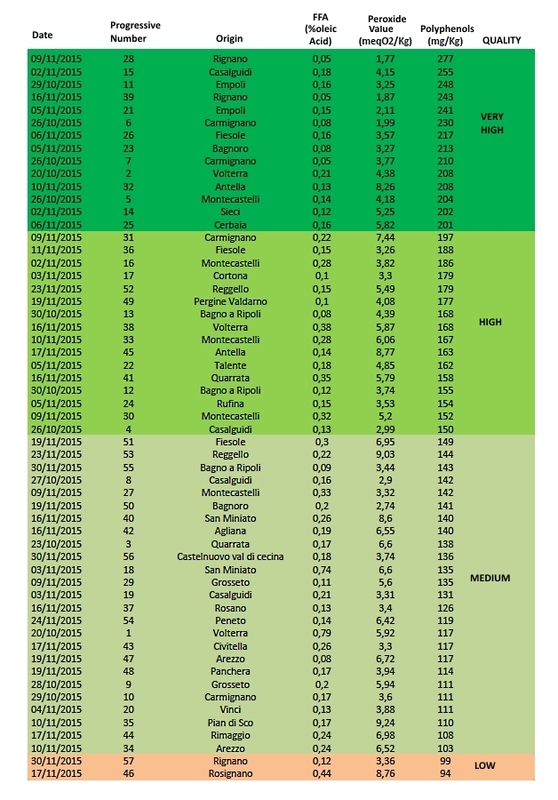 After the disastrous fall in production in 2014, which had reached almost 90% in some Tuscan areas also as a result of the olive fruit fly, 2015 was a rather “average” year both in terms of production and drupe conditions. Olive harvesting gave promising results right from the start, with an expected two-fold increase in oil production which reached an average 160,000 quintals, albeit lower than the historical average value of 180,000 quintals. The optimistic expectations in terms of production were not fully met since the delicate flowering production process and corresponding fruit set stage were not very positive. In fact, some extremely hot days reduced the fruit-set capacity, reducing expected production right from the start. On the other hand, such high temperatures also had positive effects, contrasting the attacks of the Bactrocera oleae and thus considerably reducing treatments throughout Tuscany. In any event, although the final result is not fully satisfactory for the industry, the yields reached rather good percentages, with average values exceeding 15% even in the early harvesting stage, that is as early as mid-October. As regards the ‘yield’ parameter, which is a rather variable factor, this year showed a correlation between weather conditions and yield percentages. 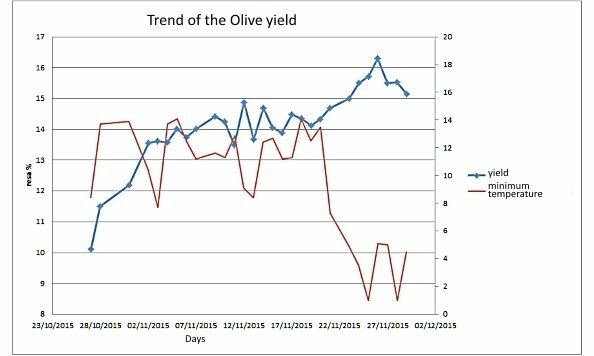 Working closely with some oil mills, we found an interesting fact shown in the graph below: a decrease in minimum temperatures increases the yield, which instead remains unaltered in case of milder temperatures. As in previous years, we used the CDR Oxitester testing system to analyse 57 samples in order to determine the level of acidity (FFA), peroxide value and polyphenols, which are the basic indicators for a complete quality check. The first point that stands out is that the average values of these parameters are good and in line with those of previous seasons, so the oil has good organoleptic and chemical-physical qualities: Acidity 0.20%, Peroxide Value4.90 meqO2/Kg, Polyphenols 162 mg/Kg. As regards the acidity percentage, only 13 out of the 57 samples showed an average value higher than 0.2%, since the conditions of the olives were generally better in the areas that we took into consideration when compared to 2013: when we examined the impact of the olive fruit fly on this parameter, we noted that the hot summer had prevented its proliferation. If we refer to the 2014 data, the annus horribilis for oil, the acidity values are very different. Indeed, in 2014 the remarkably high average acidity value was the factor that most surprised us from the very first tested samples, with values going well beyond 0.8%, which is the maximum limit to classify oil as extra virgin oil. Also this year we used our CDR OxiTester to rapidly determine peroxide value. In 2014, peroxide value had increased, despite maintaining acceptable values. It should be recalled that peroxide value reveal the primary oxidation in fats and therefore their tendency to become rancid: this year’s result is better than last year’s, confirming an excellent oil quality in oxidative terms. We classified the samples in decreasing order with respect to polyphenol value, which is an essential indicator of oil quality, weighed together with peroxide and acidity values; we thus determined, also this year, four quality categories: very high, high, medium and low. Compared to the classification drawn up in 2013 and 2014, high quality oils have more than doubled and only 2 oils fall within the low quality extra virgin oil category. As regards polyphenols compared to last year’s oil campaign, 29 out of the 57 samples showed a value exceeding 150 mg/kg, which is the threshold beyond which we define samples as high quality samples. Unlike what happened in 2014, all the samples analysed with CDR OXiTester were classifiable as Extra Virgin and none of them fell into the virgin category (i.e. acidity above 0.8%). Correlation between oil quality and summer rains. In the 2014 oil season, we proposed a study that correlated heavy summer rains with the low concentration of polyphenols and, thus, the poor quality of the oil produced. On the basis of the observations made in 2014, at the beginning of this oil season we expected oil to show a rather mild concentration of polyphenols due to the heavy rains that characterised also this summer. Quite likely, our forecast proved not to be correct. In fact, this year’s average concentration of polyphenols was considerably higher than our estimated 110 mg/kg. Our error is probably due to the fact that although the quantity of rain in the summer was considerable, rainfall was concentrated in a few days and thus did not affect the quantity of polyphenols in the drupes. In any event, we still uphold our assumption as to the correlation between summer rains and the concentration of polyphenols in oil and we will further assess it over the coming years. In conclusion, our data confirm the regional trend, with a production certainly improving in terms of quality. Unlike what happened in the past season, extra-virgin oils have the typical aromas and flavours of excellent “new” oil, since they are quite rich in polyphenols. In addition, they will likely present no preservation problems. Would you like to find out how to optimize oil quality controls? Click here and discover how easy it is with CDR OxiTester. The analysis of the quality of Tuscan Olive Oil from the 2015 Oil Season – Olive Oil chemical tests was last modified: February 8th, 2019 by CDR s.r.l.